As the story reaches its middle part, Break Blade has continuously impresses me with the way it exceeded my expectations, true enough almost all of my earlier complaints about this movie series isn't really valid anymore. As the war deepens and all the belligerents mobilizing every resource they have to claim victory, as a viewer I could help but get amazed on how the movie gives me goosebumps as I ride on excitement every passing minute of it. Break Blade 4 isn't a stand-alone movie as it simple continued where the last movie finished, and this movie being in the middle part didn't ended with any conclusions either, instead this movie is a setup for what comes next as the story is nearing its end. In this episode the viewers are treated with the introduction of the much feared General Borcuse of the nation of Athens and his soldiers followed by a very interesting battle against the forces of Krisna that ended in a draw, with the way everything balances out between the opposing forces, it is clear that the winners aren't decided yet. Viewers are expected to have watched all its previous movies to makes sense of this one. Animation is the strongest selling point of the movie. The environment is very detailed, probably one of the best detailed environment I have seen so far. The characters are also drawn very consistently and beautifully - especially the female characters. The well detailed facial expressions of the characters really shows off their emotions and feelings expressed vibrantly that the viewers can relate on. Movements are very fluid and life-like. As for the golems, while I admit that their mecha designs could have been prettier, I eventually got used to it and eventually got a liking of it seeing how it's very mecha-like on how it looks and feels very clunky, and probably looks more mecha-like compare to other mecha shows of its type. Lastly the battle scenes, the battles are well choreograph and the animation stunning and pretty much eye-candy, detailed and well executed, I'm telling this because compare to previous episodes where the battles pretty much involved only a few golems from each side. In this episode, the scale becomes bigger in terms of sheer size, as the golems involved in the battle have gone into the hundreds and the area on which the battle occurred have also turned larger. The music feels good enough and appropriate for the movie. The OP with its accompanying animation captures the image of the movie fairly well, it feels sad but appropriate. The ED meanwhile feels upbeat and lively which is pretty standard for a mecha show. The movie is also well covered by its different background music, while not really noticeable, I felt that the music played in any given scene is just about right and good to listen. The movie has a fairly good cast of old characters as well as new ones. So far I like the development of the main character Rygart, initially I don't like his character believing he will turn into a character-type with a very high sense of justice and righteousness that rubs me the wrong way, the kind of character that talks too much, spouts too much justice and righteousness and goes too far in proving their point e.g. Touma (from Index) and Naruto (from Naruto), it turned out Rygart's development goes into a more interesting path of carnage and willingness to take responsibility and fight with a clear set of goal in his mind. Another is Sigyn, it's good that the movie gives some bits of her history this time, I particularly like how her past romantic feelings for Rygart will play out as the story nears its end. Then there is this new character Girge, while not is much is revealed about him yet, it feels like he has more role to play. Other characters also have their own moments as the movie goes along, each character feels unique and given enough screentime. Voice acting is also excellent, with the actors doing a fairly good job in portraying their respective characters. Break Blade is a movie series which I initially started watching just for the sake of variety with no real expectations, it turns out to be more than what I bargain for, never a dull moment here, it has a very good story, great characters, lots of eye candies with its beautifully rendered and very fluid animation, and battles scenes that are fairly top notch. Recommended for viewers seeking a mecha show that contains a mix of both sci-fi and fantasy genre and doesn't mind the long breaks between each episode. Break Blade 4: Sanka no Chi. 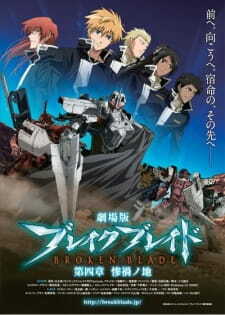 It is the 4th installment of the Break Blade series. The story continues and Rygart is still in the process of becoming a "cold-blooded killer", it is not that he is changing but he wants to change. This said, the war is progressing and more and more battles occur, some new characters introduced, but for the rest. it continues the way it was heading. As for the art, as you already might know since your on the 4th movie of Break Blade, is top-notch, very detailed and smooth making those battle scenes look better then your average anime. "Fate" by Kokia, this OP fits perfectly and bears the emotions of Break Blade. But i'd rather aim towards the seiyuu and effects'. The seiyuu do their work pretty damn good, but some just felt off sometimes, thus destroying a little of the realistic feel it would give off and making it harder for the viewer to get into the movie. But opposite to that you have the effects, when the characters are talking it is like an average anime, but when the fights start it takes a drastic turn and the sound explodes. Don't get me wrong, not in a bad way but in a good one. Every sound effect fits and is not annoying to the ears, added to that we have the extra loudness of these sound effects making the fights just that bit better. The character department stays almost the same, ofcourse we have Rygart wanting to change with some succes. But the accent in this episode is on Sigyn, she is the one that we find out the most about. The enjoyment level as always is high, it is just a better anime then the standard for me. The forth episode of Break Blade is really good and Break Blade officially become my favourite show from now on. There's not much to say. It simply continue the 3rd episode and stick to the manga although it has some changes. The war started, Rygart, accompanied by some new and old character, rolled out! Still outstanding like other episodes. Very detailed and well-drawn characters and robots. The characters are unique and cool (a new cool boy is coming, prepare yourself!). Sigyl is damn hot in this episode! The fighting scenes in this episode is even better than the previous episodes! Rygart's Delphine is truly a monster on the battlefield. The movements are smooth and powerful. What can I say here? It's just... awesome. The opening is still as touching as ever. BGM is good and there is an insert song in this episode. It fits well. So far, this is the most enjoyable Break Blade for me. Good story, nice art and animation, touching songs, cool characters, that's all about a good show. The aesthetics of the mecha on mecha combat in this series is amazing, stunning iron on iron combat with beautiful environments renders these movies a delight to observer. The past bleeds in to the present as mans presumed last hope permeates into the present in a burst of fury and might the UNDER-GOLEM as the lore inhabitants have come to call it, a titan of aviating destruction. It is a sheer joy to watch as it tears through enemies after enemies before taking a light nap to resume said destruction. I found this entry particularly heavy on narrative as the brilliance of the story unfolds itself to display the might of skilled golem on golem combat, it is a spectical to behold the physics of the battle damage in this lore, i have to give the animators their deserved dues it is simply, beautiful.